The management of post thrombotic syndrome (PTS) is multimodal and includes the use of elastic compression stockings, pneumatic compression stockings, the use of pharmacologic agents, and wound care. Medical elastic compression stockings that provide at least 20-30 mmHg compression reduce lower extremity swelling and improve symptoms associated with post thrombotic syndrome. Symptoms include pain, leg swelling, lower extremity cramps, heaviness, pruritus and paresthesias. Use of intermittent pneumatic compression units is effective for patients who have severe symptoms of post thrombotic syndrome. These devices are used during the day for symptoms relief or at night on a routine and regular basis. The use venoactive agents such as of Aescin which is derived from horse chestnut extract or bioflavonoids such as Rutosides may offer symptom improvement in patients with post thrombotic syndrome and has been shown toalso promote venous valvular health. They can be used on a long term basis in patients who have developed venous valvular incompetence or symptoms of post thrombotic syndrome. Compression therapy including skin care and topical dressings are used to treat venous stasis ulceration in patients with postthrombotic syndrome. For more information about Veinamin AM and Veinamin PM, which are horse chestnut extract products for venous insufficiency, go to www.MyVeinStore.com . For a bioflavonoid formula, read about Varicosamin on www.MyVeinStore.com. 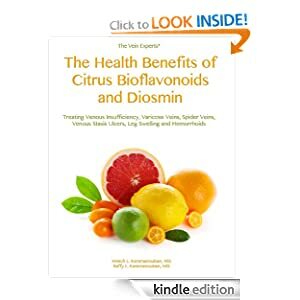 Dr Karamanoukian has written a book about bioflavonoids. To get a free copy of Dr. Karamanoukian’s book post thrombotic syndrome contact him directly by calling 716-839-3638 or go to www.VeinsVeinsVeins.com and request a free copy. To be evaluated and treated for post thrombotic syndrome in the Buffalo Niagara region and Southern Ontario contact Hratch Karamanoukian, MD FACS at the Vein Treatment Center with offices in Williamsville, New York and Clarence, New York.